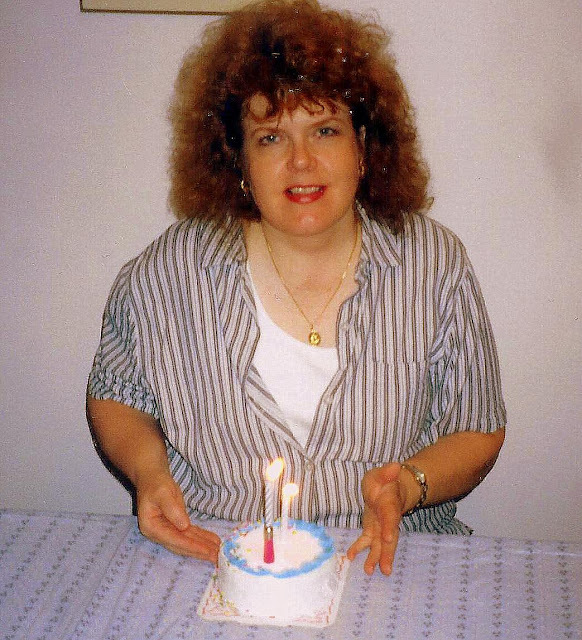 I celebrated my 59th birthday in June. Before going out to dinner to celebrate, my husband and I took a long walk along Shore Parkway and stopped for a photo by the Verrazano Narrows Bridge that connects the New York City borough of Brooklyn with the borough of Staten Island. At my age there is no denying it any longer--the road ahead of me will be shorter than the road behind me. How do I feel about getting old? The Pfizer GetOld web site asks this question and allows us to choose one response out of four. Do I feel optimistic, angry, prepared or uneasy about getting older? It is interesting to see the percentages of the responses and the comments from people of all ages. What was my response? I feel optimistic! There is a wonderful satisfaction at my age to know I have accomplished many of my life's goals: that my children are raised, educated and married, that I have survived long enough to see two grandchildren be born. My husband and I have been preparing ourselves for many years to pay down our bills and save for the future, so we feel confident we will have sufficient funds with which to retire. Physically, we try to take care of ourselves, eat healthily, and exercise to maintain our health. Mentally, we stay active in our community with volunteer work, socialization with friends and family and hobbies. Writing a blog for the last five years has encouraged me to go to more places and do more enjoyable things in my local community. I've learned so much from, and have been inspired by, many other bloggers. There is a saying that made a great deal of impact upon me when I turned fifty, nine years ago. It was: "Do not resent growing old. It is a privilege denied to many "(source unknown). I was very aware of the validity of this fact, as I have lost important people in my life who did not live to the life expectancy they hoped for. This made me realize that enjoying each day and feeling gratitude for the simplest things in life was very important; that is what I have tried to do this last nine years of my life, and I hope to continue to do so. I do not want any regrets. As my husband approaches retirement in a few years, we have many plans, hopes, and dreams for days ahead of us. In all likelihood, we will be moving West to be closer to our children and grandchildren. Leaving Brooklyn, New York, where I was born and have lived my entire life will be both a big adventure and an adjustment for me, but I look forward to exploring our future new community, joining new groups and making new friends. I want to become more active physically, travel throughout the wonderful National Parks in the West, learn more about photography, challenge myself to ride a horse, hike and ski, do more creative activities, and most of all enjoy my grandchildren! I am actually looking forward to growing older and doing all these things for as long as I can. Why not go over to the Pfizer GetOld.com website and participate in the survey and read the sticky notes from others who have left comments? You can leave your own story, photo or video about your experiences. Perhaps we can all learn from this conversation about growing old. As full disclosure, I am being compensated for this post by BlogHer and Pfizer, but all opinions expressed herein are my own. This is something a little different than my usual post, as I could not resist sharing this video! (You can skip the commercial at the start after a few seconds.) Do you think the universal language of a smile, music and dancing could make the entire world a better place? For the few minutes of this video they do! After learning a few dance steps in each location at the beginning of the video, Matt begins to dance with participants from different countries, and you can not help but feel the joy everyone was experiencing. It all began in 2006 with the video above. Matt, originally from Westport, Connecticut, had moved to Australia and enjoyed traveling around Southwest Asia. To keep his family back in the US informed about where he was, he began a blog and showing videos, which he entitled "Where the H**l is Matt?" A friend jokingly told him he should dance on each video and he began doing just that. Someone put it on YouTube and it had a million viewers before he knew it, and it has since gone of to be one of Youtube's most popular videos! Soon after the original movie was made, Matt attracted sponsors and was paid to travel and make more what he called "dancing badly" videos. At first, Matt would chose a local landmark of a spectacular piece of scenery to dance in front of -- if you watch the video above you'll see a place in Norway where I was amazed he'd even attempt to dance! However, he began to notice that when there wasn't anything of note to dance in front of and he chose a few children or locals to dance with him instead, his videos were even happier and more interesting. He went on to make many more videos which you can watch on his web site on this link, including his out takes and commercials. In this post he shows all the places in the world he has danced. What an amazing life he is leading! But in the current 2012 video Matt hopes that viewers will also contribute to one of the seven programs in different countries he danced with, such as The Haitian Relief Organization, an on the ground medical and emergency relief organization in Haiti, the Yaowawit School Kapong, an orphanage and school in Thailand which has a lodge that teaches hotel management and hospitality skills to the students, or the Axis Dance Company in Oakland, California a contemporary dance troupe that mixes performers with and without disabilities. A complete list of the charities can be seen on this link. I applaud his efforts, both in this novel way he supports himself and now his outreach towards helping others that are in need. This is an interview by a reporter in Rome, Italy (in English) that gives more info about what Matt is doing now and the process of making the videos. There is also a good interview on this NY Times link. Who would have thought that a few seconds of dancing would bring Matt fame and fortune and the opportunity to dance around the world? Matt has become sort of an ambassador of dance, and has helped bring a happy smile to many faces! Do you like to dance? Wouldn't you love to dance around the world? Did my title grab your attention? I hope it did, and that you will stay with me to read what I have to say, and agree to "Pledge to Have The Second Talk with Poise," and also to have a chance to win a $250 Visa gift card! Menopause is an important topic for all women, especially those over the age of forty. I think all women remember their "first talk" with a trusted adult about the changes they could expect in their bodies at puberty. 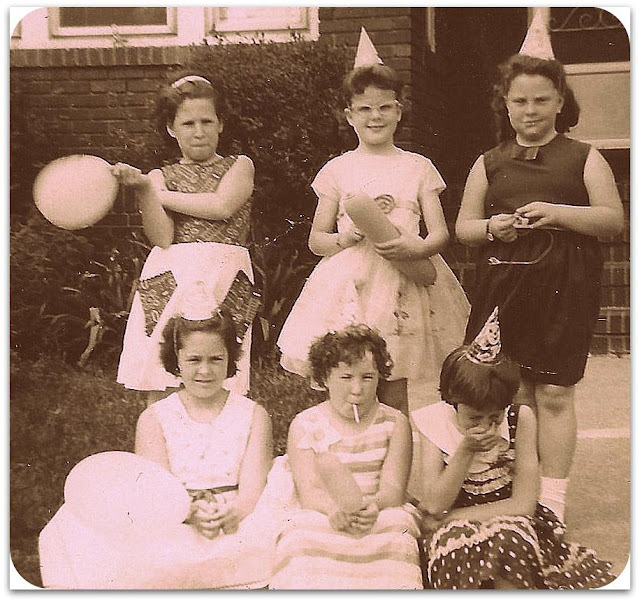 Not long after the above photo that was taken at my ten-year-old birthday party (I am the skinny girl, top middle with the cat eye glasses) I went through puberty and began menstruation for the first time. It was a monumental event that I was totally unprepared for. I had my first period while I was away for a sleepover at my best friend Ruth's house on Long Island. She had moved away that year, and we missed each other very much, as best friends do, so her parents had picked me up so we could spend the weekend together. I was confused and scared to wake up and see what was happening to me, but luckily Ruth had already begun to menstruate the year before and told me it was my period. Ruth's mother very kindly and gently gave me all the supplies I needed and told me how to use them. She then told me to call my mother and tell her what happened, and between Ruth's mother and mine, I learned all I needed to know about menstruation at that time. It was my "first talk," and one I'll never forget! Flash forward forty-four years, and I completed menopause, the normal time in a woman's life when her periods (menstruation) eventually stop and the body goes through changes that no longer allow her to get pregnant. It is a natural event that normally occurs in women age 45 - 55. For around ten years before, when my ovaries began to stop their production of estrogen and progesterone, I felt the usual menopausal symptoms of night sweats, racing heartbeat, hot flashes, occasional insomnia, joint aches and pains and even the beginning of some forgetfulness. Except for an occasional conversation with a friend, where we would agree that having hot flashes could be rough, I hardly ever spoke about what I was going through with other women. There were no formal "second talks," not even from my gynecologist, about what to expect or how to address symptoms. As a registered nurse, I knew my menopausal symptoms were normal and expected, but my experience made me realize that women going through menopause could feel alone, confused, and anxious about their symptoms. That is why I agree with the Poise brand that women should be better prepared for what to expect in menopause and how to manage their symptoms. Poise brand wants to help women approach this stage of life with confidence, by being the first to start The 2nd Talk, a whole new way to talk about menopause and other wellness issues for women over 40. Poise brand has also designed five new, first-of-its-kind line of over-the-counter menopause products designed to work naturally with a woman's body and provide comfort during menopause and address hot flashes, vaginal odor, and dryness. Although my menopausal symptoms are now not as severe as they once were, I know I will enjoy using the Body Cooling Towelettes which offers instant cooling and refreshment when I experience a hot flash. All I will have to do is gently wipe the towelette on my wrists, chest, or neck to feel cool and comfortable. Featuring a portable, re-sealable package, these towelettes are easy to use anywhere I go. The Roll-On Cooling Gel is another new product that would easily fit into my pocket when I am on the go, to help me feel comfortable and refreshed when a hot flash strikes. All I'll have to do is squeeze the tube and gently roll the cooling gel on my wrists, chest, or neck for a cooling sensation that lasts up to 10 minutes. These new Poise products will definitely help me feel more comfortable and confident. To launch this first generation of female products, Poise brand is creating the revolutionary idea to host The 2nd Talk, a conversation led by Poise between moms, sisters, experts, and friends. Poise brand wants to rally 1 million women to pledge to have The 2nd Talk by World Menopause Day on October 18. By joining the conversation, women will gain more menopause knowledge, support, and better solutions to help make this life stage better for generations to come! Won't you take the time right now to make the pledge to join the conversation at The2ndTalk.com? Then come back to my blog and be entered for a chance to win a $250 Visa gift card by leaving a comment below that answers this question: "When do you feel most confident?" Are you still enjoying all the bounty of summer's fresh fruits and vegetables? 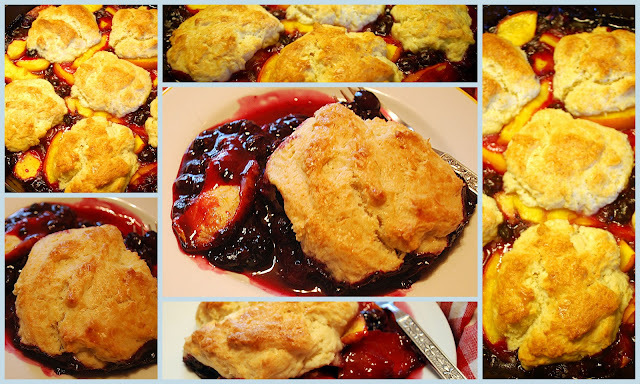 I combined two of my summer favorites, peaches, and blueberries, to make this fabulous cobbler. I love the convenience of making food in a cast iron skillet, both stovetop or in the oven, as I think everything looks cozy and homey cooked this way. The skillet also serves as the serving piece, so it's perfect for an informal gathering or family meal. Just make sure you wrap a tea towel or an oven mitt around the handle and use a hot plate underneath when serving, as the cast iron retains heat for a long time. I have an entire Pinterest folder devoted to a collection of cast iron skillet recipes that you can see on this link. This is where I found the idea for this cobbler recipe. It is a Martha Stewart recipe for a Blueberry Apricot Cobbler, but I modified the recipe to substitute peaches for the apricots. Preheat oven to 375 degrees, with racks in middle and lower thirds. In a large bowl, whisk together cornstarch and 1/2 cup granulated sugar. Stir in peaches and blueberries. Spread mixture into a 10-inch cast-iron skillet. In a food processor, pulse remaining 2 tablespoons granulated sugar, flour, baking powder, and salt until combined. Add butter and pulse until mixture resembles coarse meal, with a few pea-size pieces of butter remaining. Add heavy cream and pulse 2 or 3 times until combined. Spoon batter in 8 mounds on fruit mixture. Press lightly on tops to flatten, brush with heavy cream, and sprinkle with sanding sugar if desired. 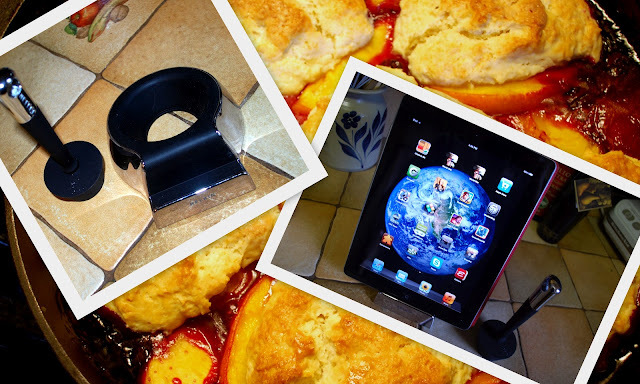 Are you like me and use your iPad to follow an online recipe as you cook? A gadget I have been enjoying lately is this Belkin Chef Stand and Stylus made for the iPad 2. The soft rubber lined holder holds the iPad securely either horizontally or vertically, and the rubber tipped stylus is perfect to use to scroll the screen when my fingers are messy from food preparation. The magnetic tip on the wand works with any touchscreen, and can also be used to wake up an iPad 2. I love it! This stand was a birthday gift, and I am not in any way being compensated by this company, but I thought I'd pass along the wonderful function ability of this stand for iPad users. I love having a virtual cookbook at my fingertips, and it makes viewing and following all your wonderful blog recipes on my tiny kitchen counter easier this way! On a sad note, the news from Aurora, Colorado this morning was unbelievably tragic and horrific. My thought and prayers are with the victims and their families. 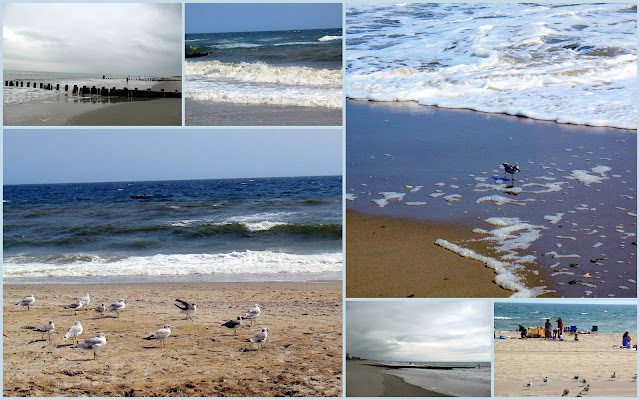 I am very fortunate to live ten minutes by car from the beautiful Rockaway beaches in Queens, New York. On hot summer days, you can often find me at a beach, enjoying the cool breeze from the Atlantic Ocean, as I take a long walk along the shoreline. 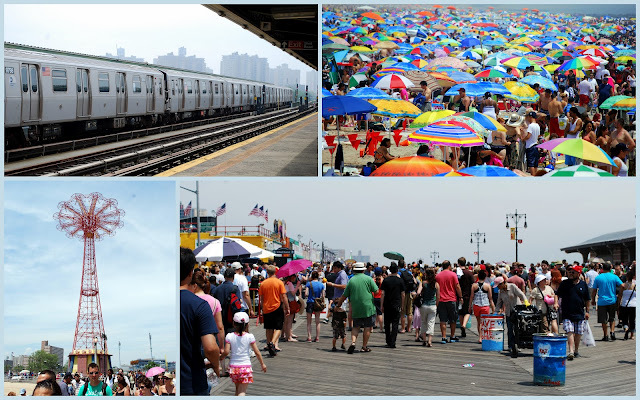 Another favorite beach destination that I enjoy which is only a quick subway ride away is the fabled Coney Island beach in Brooklyn, New York! Here I love to walk on the boardwalk, enjoying the lively crowds and the sights, sounds, and smells of summer. Unfortunately, some of the other aspects of summer -- sun, sand, salt water, and sweat can play havoc on my skin, so I was thrilled to be offered the opportunity to review one of the new revolutionary lines of premium washes from Dove. I was sent a full size, 18 fluid ounce bottle of the New Dove® Visible Care Renewing Crème Body Wash to use in my daily bath routine. It feels so good to take a long cool shower after morning walks on the beach, and then relax afterward reading my favorite blogs. The Renewing Body Wash is specifically made to nourish and replenish skin and promises "visible skin improvement in just one week" with daily use, so I was looking forward to trying it. I have been a faithful user of Dove bar soap for almost my entire life, so I was curious to see what results I would have of using the new Dove® Visible Care Renewing Crème Body Wash on my skin. I immediately noticed the body wash had a rich, pearlescent creme format that created a luxurious lather and a clean rinse, and had a pleasant scent that was made up of a combination of pink mimosa and pomegranate. It contains a mild cleanser, glycerin, and stearic acid and the highest concentration of Nutrium Moisture technology across the Dove portfolio. I liked the sturdy wide base, which also contains the opening tab, and I found the entire bottle design was easy for me to handle in the shower as well as sit comfortably on my bathtub rim. I really enjoyed using this body wash! * Using the Dove® Visible Care Renewing Crème Body Wash daily for one week did indeed make my skin feel nourished and replenished as if I had indulged in multiple spa treatments! The dry patches I usually have on my elbows and heels practically disappeared. I now want to try the other two body washes in this line: the New Dove® Visible Care Toning Crème Body Wash helps to promote skin’s elasticity and strength with the addition of Vitamin E, and the Dove® Visible Care Softening Crème Body Wash which promises to soften skin and dry spots. To learn more about these three new body washes please visit the Dove website at this link. *In full disclosure I was supplied with a free bottle of Dove® Visible Care Renewing Crème Body Wash for this review, but my opinions for this product are unbiased and my own. It is time for Vee, of A Haven For Vee, monthly Note Card Party, where participating bloggers choose four photos from previous blog posts that they feel would make wonderful note cards. I can't believe how quickly the time passes between each month, and how enjoyable it is to see all the wonderful photos that fellow bloggers choose. If you are a long time reader of my blog you might remember that my husband and I love to visit and explore the magnificent National Parks in the West. Even photos can not do them justice, as one needs to see these sights in person to truly appreciate their spectacular beauty! The photo above is from this blog post and is a scenic overlook view of Glacier Point in Yosemite National Park in California. This overlook had a commanding panoramic view of Yosemite Valley, Half Dome Peak, and the High Sierra. The next photo is from the Grand Tetons National Park in Wyoming, on this post. Rising more than 7,000 feet above the valley of Jackson Hole, the Teton Range dominates the park’s skyline. The elevation of the park ranges from 6,400 feet on the sagebrush-dominated valley floor to 13,770 feet on the windswept granite summit of the Grand Teton, with forests carpeting the mountainsides. One of the most iconic views from the National Parks is the Old Faithful Geyser in Yellowstone National Park in Wyoming. More can be seen on this post. Old Faithful Geyser was named in 1870 by a surveyor H.D. Washburn. Its eruption height varies from 106 to 184 feet, every 90 minutes. The temperature before an eruption is 240 degrees Fahrenheit, and during eruption between 3,700 to 8,400 gallons of water is discharged. It is the most photographed sight in the park. The second most photographed sight in Yellowstone National Park is the Lower Falls, which can be seen on this post. Located in Yellowstone's Grand Canyon, and 308-feet long, it is the biggest waterfall in Yellowstone, and the most famous. Countless artists have painted this view! I hope you enjoyed these four glimpses into a few of the many National Parks in the United States, and I hope I've encouraged you to want to visit them or revisit them. I can't wait to go back to each one of them again one day! Now go over to A Haven For Vee and see the rest of the note card selections -- you won't be disappointed! Has it been hot where you are? About the only thing that seems to love the cool rainy spring we had here in Brooklyn, New York, and now the humid heat is the hydrangea bush growing in front of my house. It has grown to epic proportions this summer! Passersby stop and ask me what I do to get so many flowers. I wish I knew! I made many bouquets from the flowers in the past couple of months. I've even told my neighbors to help themselves to flowers if they want to make bouquets, as this bush keeps on blooming! .....this shade of pink! The photo above was taken last year. 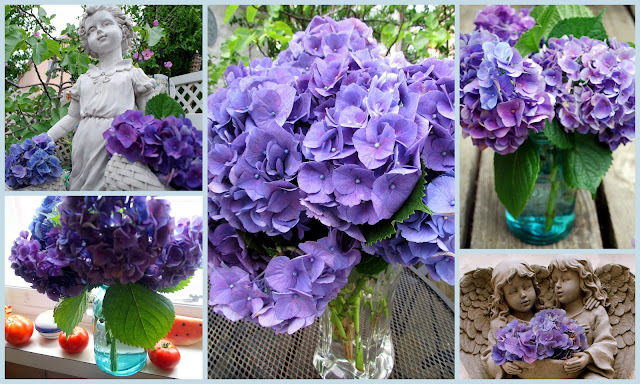 It certainly has been a hydrangea summer here this year, and I'm loving it! How are your flowers growing this summer? July 16th would have been my Mother's 90th birthday. 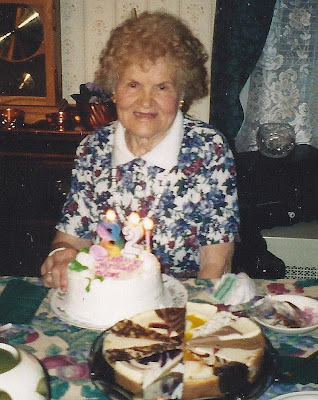 Happy birthday in heaven, Mom! We all miss you dearly. I love summer's bounty of fresh fruits and vegetables, and at this time of the year, one of my favorite choices at the market is blueberries! The price of a quart of blueberries becomes the same price, or lower, than the smaller pint, or half a pint, of berries I buy during other seasons. I treasure blueberries in fall, winter and spring, and add just a few a day on my morning cereal or oatmeal. In summer, however, when they are in abundance, I love to use them in baking! I usually make our favorite Blueberry Tart, but while browsing Pinterest one evening I came upon a recipe for an amazing looking Strawberry Yogurt Cake and decided to make a few adjustments to the recipe and substitute blueberries for the strawberries. According to the Blueberry Council, blueberries are one of the healthiest foods we can eat every day as they are very high in antioxidants, vitamin C and manganese. The council also offer tips on how to cook with blueberries and have many recipes on their web site. I was excited to use this beautiful Nordic Ware Heritage Bundt Pan for the first time, which a good friend had given me for my birthday in June. 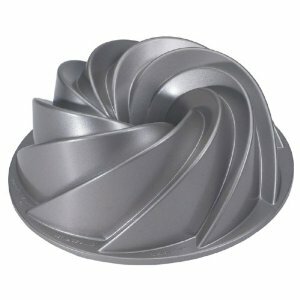 I love using a Bundt pan to bake cakes. They usually look attractive, require no frosting or at the most a light dusting of powdered sugar, and are easy to slice and serve. I have collected an entire Pinterest board devoted to Bundt pan style cakes, so I'll never run out of ideas for wonderful cakes to try! Sift together the 2 1/4 cups flour, baking soda, and salt. Mix in the lemon zest and set aside. 2. With an electric mixer, cream together the butter and sugar until light and fluffy. Beat in the eggs one at a time. Stir in 1 tablespoon lemon juice. Alternately add the flour mixture and the yogurt, the mixture just until incorporated. 3. Toss the blueberries with the remaining 1/4 cup of flour. Gently mix them into the batter. 4. Pour the batter into the Bundt pan. Lightly knock the pan on your counter to remove all air bubbles in the batter. Bake in the preheated oven for 60 minutes, or until a toothpick inserted into the center of the cake comes out clean. 5. Allow to cool 10 minutes in the pan, then turn out onto a wire rack and cool completely. My husband and I enjoyed every bite of this cake, and I hope you will too! Thank you to everyone for all your very flattering comments on my last post! I do love New York City and to be called a "blog ambassador" for it is the highest compliment you could have given me! It was hot and steamy here in New York City this weekend, as it has been almost since summer began a few weeks ago. 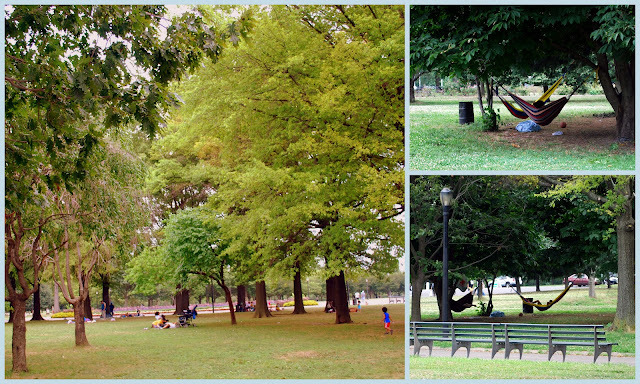 Tired of staying inside in air conditioning, and feeling a bit of cabin fever, my husband and I decided to take a drive to Flushing Meadows Corona Park in the borough of Queens, New York. 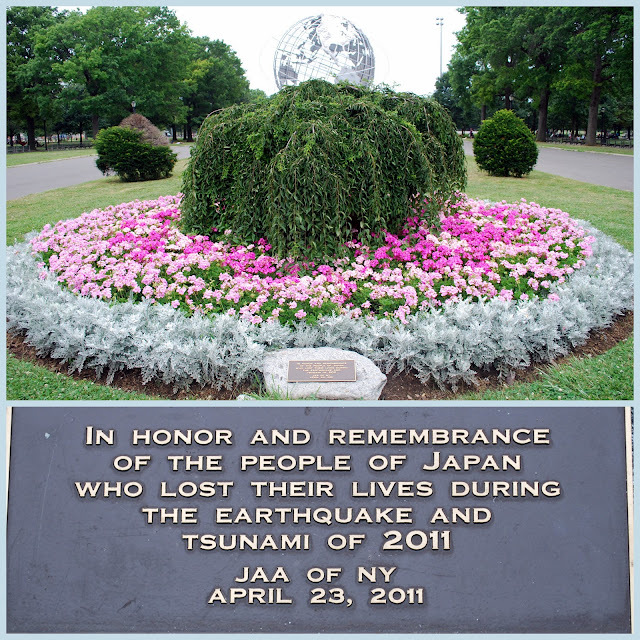 This 1,255-acre park has historical, recreational and environmental significance as it was created as the site of the 1939/1940 New York World's Fair and also hosted the 1964/1965 New York World's Fair. Queens is the most ethnically diverse urban area in the world with a population of over 2.2 million, 44% of whom are foreign-born, representing over 100 different nations and speaking over 138 different languages. It seems so suitable that this iconic Unisphere, a leftover from the 1964-65 World's Fair is the centerpiece of the park. 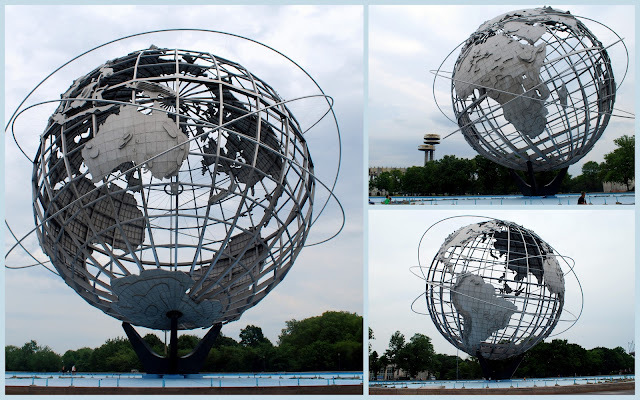 The monumental stainless steel globe, standing 140 feet high, 120 feet in diameter and weighing 700,000 pounds, was built and presented to the 1964 World's Fair by United States Steel. It was "dedicated to man's aspirations towards Peace through mutual understanding and symbolizing his achievements in an expanding universe." Most of the prior World's Fair pavilions and exhibit halls have been dismantled and some moved to other locations across the United States, but a few other remnants remain. 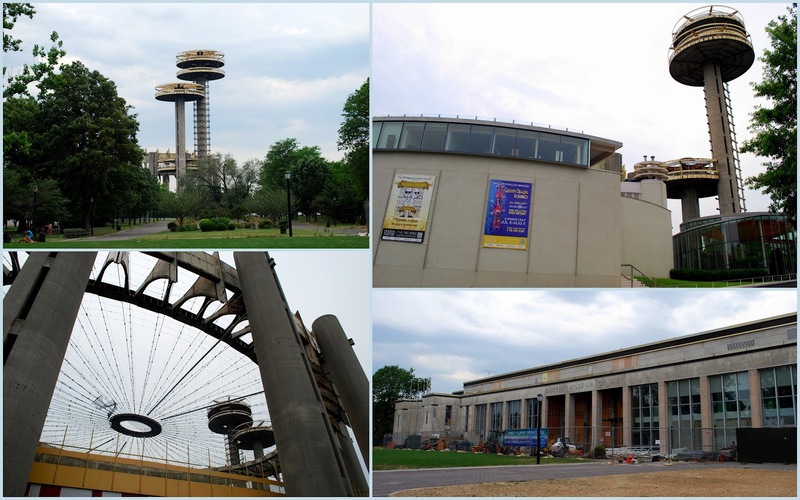 The New York State Pavilion--the tall space age looking buildings seen in the top left and lower left in the photo collage above--have more or less been abandoned to a state of disrepair, but are sentimental icons of the park. The pavilion's old "Theaterama" portion, seen in the upper right of the photo collage, is home to the Queens Theatre, a performing arts center which produces and presents theatre and dance, as well as children's and cultural programming. The New York City building, seen in the lower right of the photo collage above, was constructed for the 1939 World’s Fair. It also hosted the United Nations General Assembly 1946-50. In 1972, it became The Queens Museum of Art. The museum is open, but is also undergoing extensive renovation and expansion. It houses the well-known Panorama of the City of New York, a scale model of the five boroughs built for the 1964 World’s Fair, which I will be showing in a future blog post. I have many fond memories of visiting the 1964-1965 World's Fair with my parents and siblings when I was young. It was as spectacular to me as Disneyland might have been if I were lucky enough to have been able to visit that as a child. In fact, Disney did have the same "It's a Small World" ride and exhibit on display at the NY World's Fair (click on the highlighted words to see a video of Walt Disney narrating the ride at the World's Fair). It was one of my favorite exhibits! I also remember riding the large Uniroyal Ferris Wheel and visiting the GM "Futurama" exhibit (click the highlighted link to watch a video of that). The Vatican Pavilion at the fair displayed Michelangelo's stunning "Pieta" statue, which attracted millions of visitors. Usually, on display in St. Peter's Basilica in Rome, Italy, it had never been taken from the Vatican until Pope John XXIII, before his death, granted permission for it to be brought to the fair. Pope Paul VI agreed with his predecessor to allow the statue to travel to New York in 1964. You can see how the statue looked in the World's Fair exhibit on this link. Some of the World's Fair statuary and fountains also remain in the portion of the park that was once the fair's grounds, although none of the fountains were working the day we visited, including the fountain that surrounds the Unisphere. There were also some beautifully landscaped areas in this area of the park, including this small poignant circle of flowers in memory of those who lost their lives in the earthquake and tsunami of 2011. ...... Citi Field baseball stadium, where the National Baseball League New York Mets play their home games. Click here if you'd like to read more about Citi Field I wrote a previous blog post. 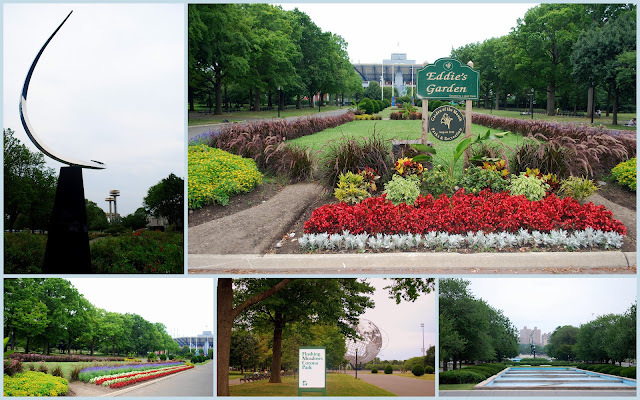 The USTA Billie Jean King National Tennis Center (NTC), home to the US Open is also located in the park. The NTC is open to the public throughout the year, offering three stadiums, plus 22 outdoor and nine indoor courts. Its centerpiece, Arthur Ashe Stadium, is widely recognized as one of the world’s greatest sports and entertainment venues. Click here if you would like to read about my visit to Arthur Ashe Stadium last year for the US Open men's semifinals. Flushing Meadows Corona Park is definitely a jewel in the NYC borough Queen's crown, and worth a visit! 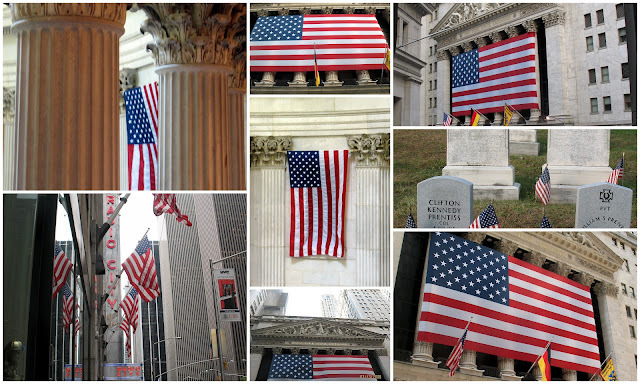 July 4th - Happy Independence Day! All photos were taken by me during various airplane trips across the beautiful United States of America.